One day after being sworn in, Narendra Modi, India’s prime minister, hold talks with his Pakistani counterpart as part of his visit to New Delhi to attend the newly elected Indian prime minister’s oath-taking ceremony. Sharif was one of eight regional leaders who attended the inauguration ceremony in New Delhi for Modi. The meeting which Sharif described later as “good and constructive” and held in “a warm and cordial atmosphere”, was the first time the prime ministers of the South Asian neighbours had held talks since 2002. Modi – who was the chief minister of Gujarat – campaigned on an economic platform that promised to deliver development after years of corruption under the Congress-led coalition government. Known to be pro-business, Modi has promised to facilitate further investments in power and other projects. For many, Narendra Modi is India’s savior, while others see him as a divisive figure. He still stands accused of not doing enough, or nothing at all, during sectarian riots in Gujarat back in 2002. More than 1,000 people, mostly Muslims, were killed in that wave religious violence. In neighboring Pakistan, Modi’s win is being watched closely. He has made it clear that he would not tolerate cross-border attacks. But many in Islamabad say, they hope Modi’s victory would improve ties between the two countries. Sharif became the first Pakistani prime minister to attend an Indian prime minister’s inauguration since the subcontinent’s partition in 1947. In an official statement, Sharif announced that the two countries’ foreign secretaries “would be meeting soon, to review and carry forward our bilateral agenda, in the spirit of our meeting today”. He also said he pointed out to Modi that “we were at the beginning of our tenures, with a clear mandate. … The one and a half billion people of the two countries want us to focus on their well-being and welfare”. For his part, Modi said India and Pakistan could immediately move towards normalising trade ties. After the inauguration ceremony, Modi said in a series of statements on Twitter: “Nawaz Sharif ji told me that he stays in Islamabad but goes to meet his mother once in a week. The meeting in Delhi “allows Modi to shed his hardline image and emphasize his desire to be seen as a statesman with the gravitas that comes with the office of prime minister of India”, Bharat Bhushan, Delhi-based political commentator and founding editor of India’s Mail Today newspaper. Sharif promised to pick up the threads of a failed peace process which went on during his second term in office – coinciding with the last time Modi’s BJP was in power in India. In 1999, AB Vajpayee, then India’s prime minister, rode a bus to the Pakistani city of Lahore to sign an accord with Sharif, but three months later the neighbors nearly went to war over Kashmir. The talk has been the first time an Indian prime minister has hosted a Pakistani leader for official talks in New Delhi since the rupture in relations that followed the 2008 attacks in Mumbai when 166 people were killed. 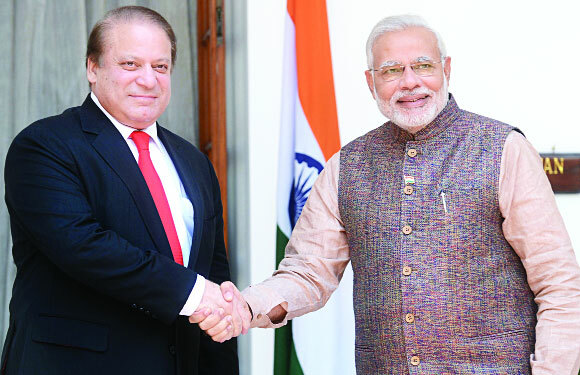 While the outcome of the Delhi meeting has been positive judging by initial accounts, Modi’s decision to invite Sharif caught the Pakistanis by surprise, says Fahd Husain, news director for Pakistan’s Express News Network. The Pakistanis took their time to go over the pros and cons of going to India, but when the decision to go was made, the response was positive, Husain told. In an interview with India’s NDTV, Sharif said Modi’s arrival in power after a landslide election victory represented a “great opportunity” for the countries to open a new chapter in relations. “This is a chance to reach out to each other. Both governments have a strong mandate,” he said. Modi told Sharif to crack down on fighters operating in Pakistan, while stressing his desire for better relations and trade, the Indian Foreign Ministry said. While Sharif’s visit has attracted attention and positive reviews in both countries, it is unclear if it will have any significant long-term impact on relations between India and Pakistan. Express News Network’s Husain thinks Sharif’s decision to go to India and meet Modi holds great symbolic value. “It focuses on the bigger picture, to assess what needs to be done next,” he told Al Jazeera. Bhushan is more cautious when it comes to rapprochement between India and Pakistan. “We must not front-load the prime ministership of Narendra Modi with high expectations of peace with Pakistan,” he says. The massive election win of the right-wing nationalist Bharatiya Janata Party, led by a hardliner, in India’s recently concluded general elections has set alarm bells in neighboring Pakistan, but there is also a cautious optimism about improving ties between the two South Asian countries. The BJP leader repeatedly promised to be less tolerant of what India sees as Pakistan’s sponsorship of terrorism on its soil. However, there is room for optimism, analysts say, as long as the campaign rhetoric does not migrate to the prime minister’s office. “While Modi may need to sound tough in a bid to appease the hardliners within his party, peace with Pakistan will be a necessity for his economic and developmental agenda,” Raza Rumi, a senior fellow at Islamabad’s Jinnah Institute told. Sherry Rehman, a former Pakistani legislator and former ambassador to the US, told Al Jazeera that the tone of the relationship will depend on how much “value Modi places on ideology and identity”, given a campaign that leaned heavily on appealing to Hindu majority nationalism and communal identity. “Modi is better placed than any other government since the Rajiv Gandhi government to make history if he so chooses. He has the blockbuster mandate, and need not be hamstrung by the Lok Sabha [lower House of parliament], like (Manmohan) Singh often was, in pursing promises made to Pakistan,” she said. One of Sharif’s key promises in May last year were to open up trade with India, the regional economic power, with whom Pakistan’s trade is currently hamstrung by restrictions and an almost complete ban on trade in services. At present, the bilateral trade stands at approximately $2bn, with $1.7bn of that represented by Indian exports, and $350m in Pakistani exports. Informal, untaxed trade, analysts told is likely a further $2bn. Meanwhile, the issue of terrorism remains a major bone of contention between the two countries. India has consistently asked its western neighbor to act against armed groups operating on its soil that have targeted it, while Pakistan denies that it has either sponsored such activity or that concrete evidence has been shared regarding Pakistani groups’ involvement. The Pakistani Foreign Office has reiterated its commitment to an aborted Composite Dialogue process, which has been stalled for the last three years. “We expect that when the new government takes over in India, realizing the importance of having peace in the neighborhood, the dialogue process between Pakistan and India will resume,” said Tasneem Aslam, the foreign office spokesperson, at a weekly briefing. It remains unclear what kind of prime minister Modi will be – and how true he will remain to “Candidate Modi”, who relied heavily on exclusionist, communal rhetoric and promises of a tough stance against Pakistan.